The construction of screened porches in Springfield, Virginia are on the rise. These classic outdoor rooms are designed to enjoy natural sunlight and the surrounding landscape. They also provide an essential haven from adverse weather and insect predators. Screened porches in Springfield offer comfortable living space for relaxing and entertaining 3 to 4 seasons of the year. Before you determine the size and location of your screened-porch check local zoning and building code requirements. Working with a licensed, experienced contractor ensures legal and structural compliance, quality workmanship, and cost effectiveness. A local screened porch builder also brings practical experience, technical knowledge, and the resources needed to construct a well-built structure that incorporates your specifications and dreams. 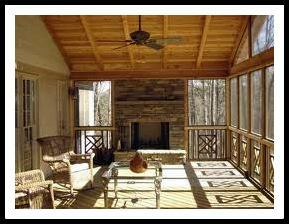 Well-planned screened porches include design features that make your lifestyle as comfortable as it is easy. Choose durable, easy-care materials that deliver compatibility with your home architecture. Innovative technology has revolutionized the traditional screened porch with materials, colors, and textures that merge to create functional, interesting, and beautiful screened room environments. This is the stage of your planning process that determines the final functionality and appearance of your screened porch, so take the time to do the research needed to make well-informed decisions. A vaulted ceiling on your screened-in porch encourages air flow and makes your porch seem more expansive. Plan carefully for electric outlets and lighting needs. Plastic screening provides durability, easy maintenance, and rust resistance. Ceiling fans keep air circulating to provide cooling. Installing doors between your home and your screened porch offers additional privacy and insulation against colder weather. Contemplate the different ways you want to use your screened porch and determine what features will best accommodate your needs. Use the internet to find and collect ideas to enhance your screened porch living. This entry was posted on Saturday, August 31st, 2013 at 2:19 pm	and is filed under Screen Porches. You can follow any responses to this entry through the RSS 2.0 feed. Both comments and pings are currently closed.